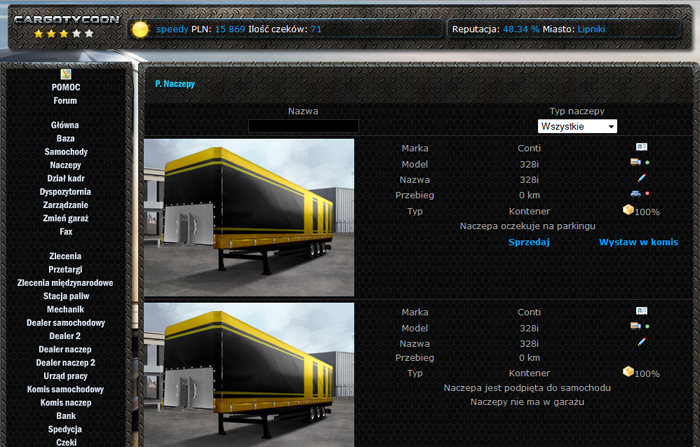 CargoTycoon is a game where you become the owner of a transport company. It's not an easy task, so if you like games which require creative, logic thinking and you feel you can manage your own company than this game is for You. You have to organise lots of things: purchase of new and used vehicles, employ drivers, train them, decide about their holiday. Finally, you have to complete your orders which will provide money for your investment in the company. You have to decide where to build branches of your company so your transport network becomes more efficient. As it turns out running your own company is not easy so you will face many problems, care about reputation of your company, to gain access to better clients, care about your employees becasue thanks to them you are able to deliver your orders. 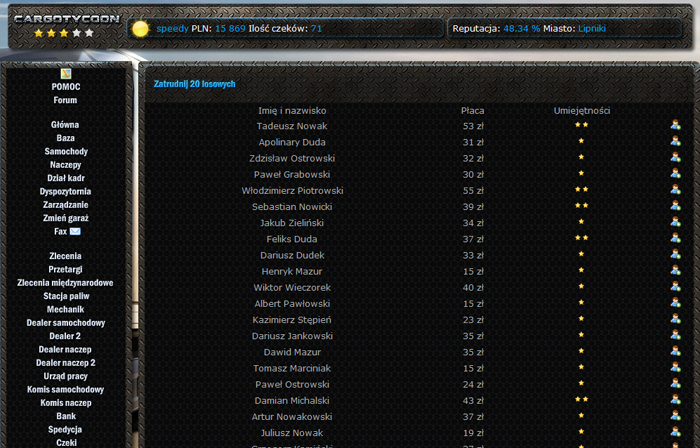 Main page in game showing all events in the company and time to their finish. Tab showing vehicles in the garage and information about them. Tab showing trailers in the garage and information about them. Here you can see details of your employees. This is your Dispatch, here you have details of all orders that you accepted. Here you search your orders. 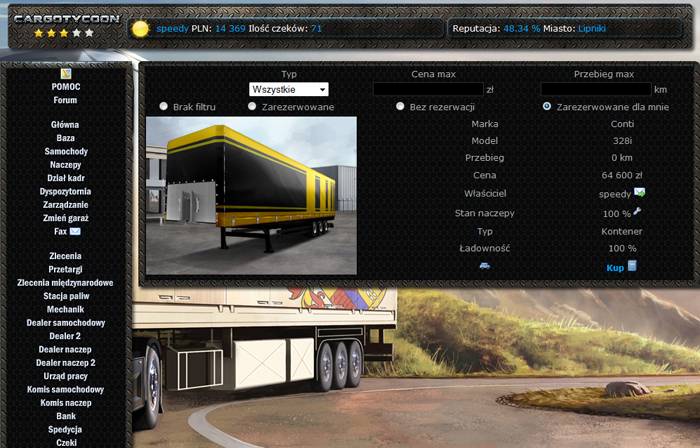 You can choose from different types of the cargo, required type of vehicle, destination cities. Tenders are big orders which different companies have to bid for. You have to presents best offer to get it. 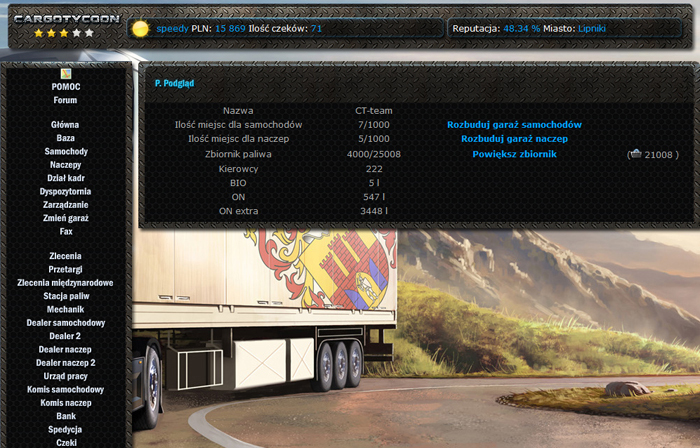 Truck dealer. Buy new vehicles and choose their add-ons like ABS, cruise control, etc. Trailer dealer. 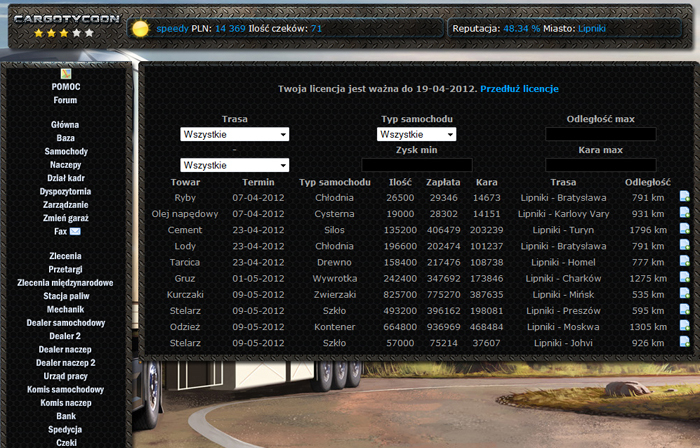 Here you can buy trailers for your tractor trucks. 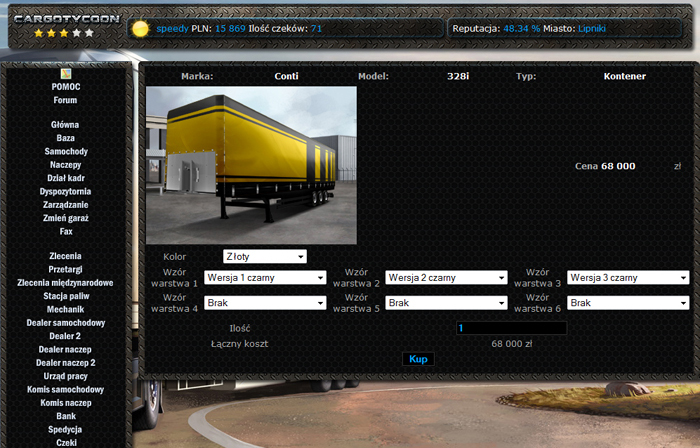 Game provides few different types of trucks and trailers, which you can use to deliver cargo. When you order them you can choose their colors or patterns that will be applied. 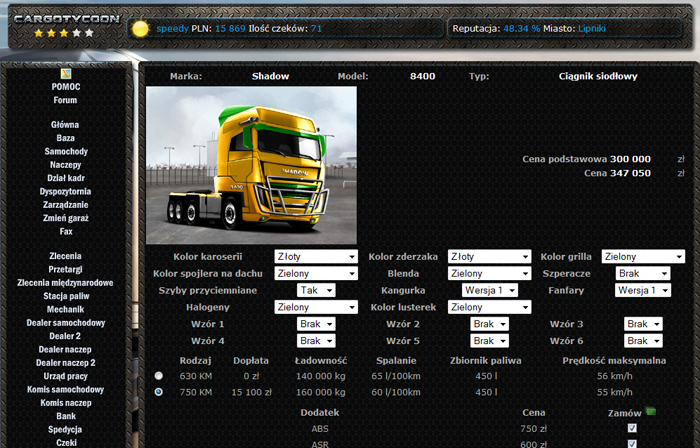 For some vehicles you can choose different version of the engine, what will change vehicle's specification and make the truck more useful. That isn't all yet. You have to make right logistic decisions in choosing your orders, accepting most profitable ones so your balance won't be negative. You have to make sure deliveries are done on time, otherwise you will pay penalty. Gaining further stars, i.e. next levels(licences) gives you access to more options for your company. Like tenders where you compite with other players for one big order, as well as international orders thanks to which you can build branches abroad. 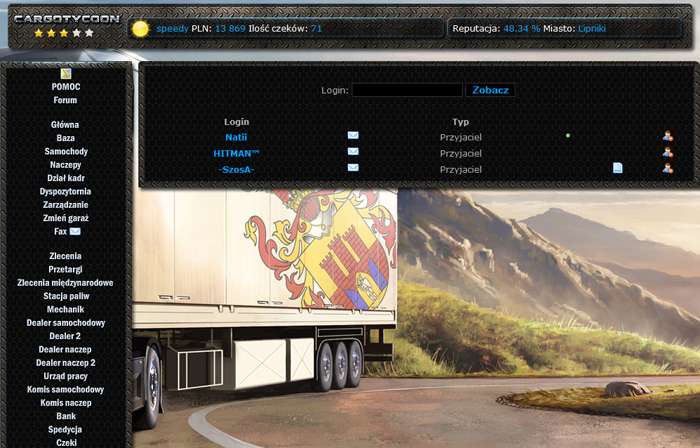 You can even establish your own Shipping and employ other players to deliver huge orders. Remember that owner's reputation is at stake if Shipping order isn't delivered on time. Fuel station, order fuel for your garages. Job office. Here you can employ drivers. 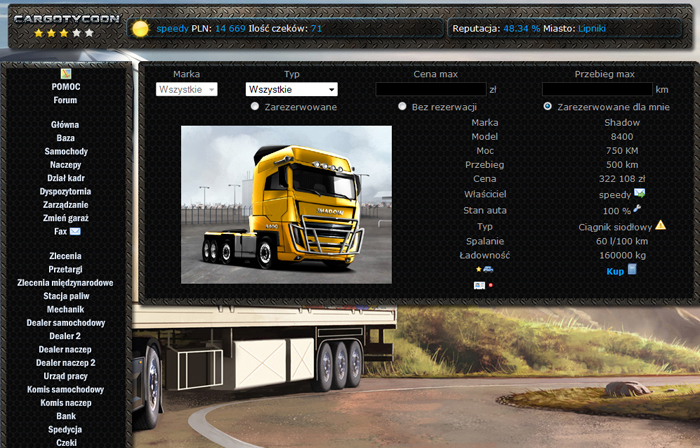 In Workshop you can tune or fix some elements in your vehicles. Used truck garage. 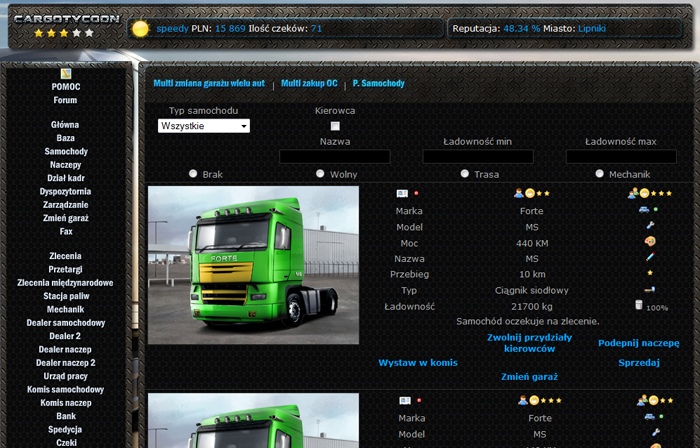 Players can sell vehicles between themselves. Komis naczep, służący do handlu naczepami. Shipping tab. Association of players delivering huge amounts of cargo together. Players Ranking showing your presents position. 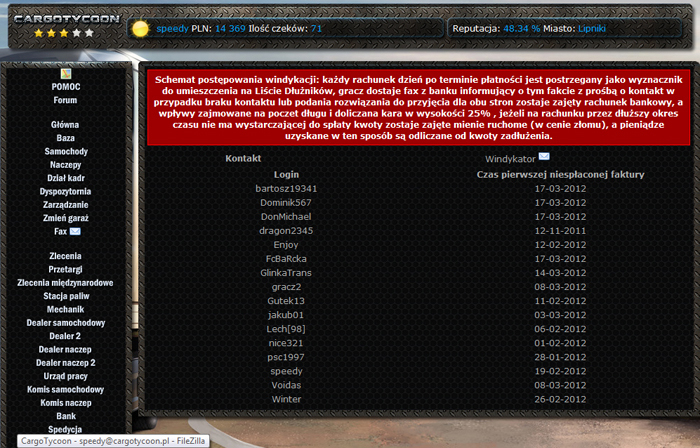 When you gain proper level you will have access to international orders. Players who don't pay their covenants are put on bailiff's list. Bailiff has the right to take away trucks and trailers off those players and put them at auction where other players can bid for them. 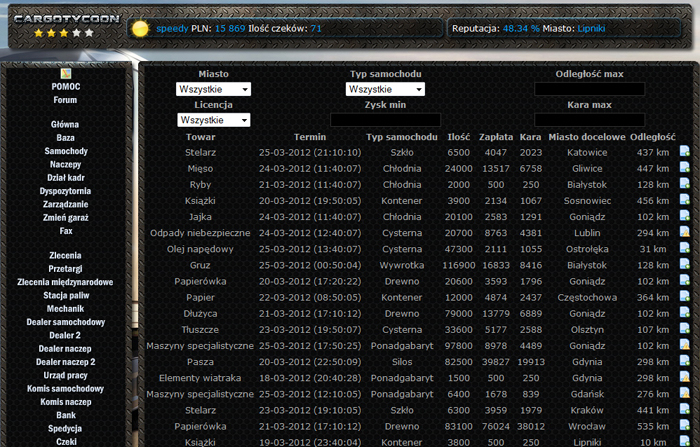 Players can create their own lists of friends, foes and associates. If you feel you will rise to this challenge don't wait any longer and register.